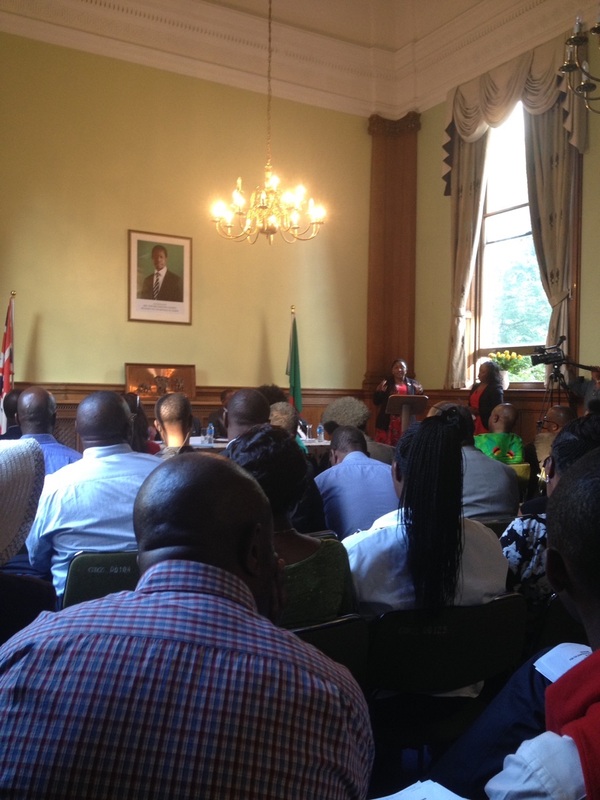 Diaspora for African Development (DfAD) is a Zambian Diaspora-led non-profit organisation registered in the United Kingdom. DfAD aims to contribute to Africa’s sustainable social and economic development through harnessing the potential of the African Diaspora in four core programmes; Agriculture, Education, Enterprise and Health. We work in Southern Africa with an emphasis on Zambia. Team DfAD is currently made up of 15 volunteers, predominantly Zambian Diaspora, who give their time and resources whilst working in full time jobs or are in full time study, with family and other commitments, such as running their own businesses. In 2010, the Government of Zambia and the International Organisation for Migration (IOM) conducted a survey that gave an indication as to what the Zambian Diaspora numbers were. 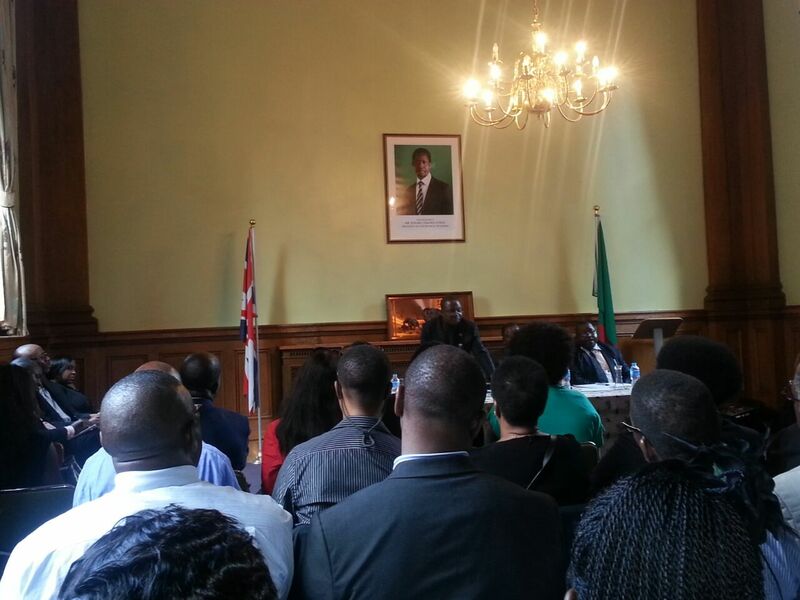 The survey results showed that the United Kingdom had the largest concentration of the Zambian Diaspora in the world, in excess of 15,000. The study also captured Diaspora views and aspirations, highlighting their potential for participation in national development, which was being hampered by the lack of government institutional capacity to effectively engage them. As a Zambian Diaspora led organisation, DfAD strongly believes that the formulation of an adequate Zambia Diaspora policy framework, and the mechanisms for implementing it, is a prerequisite to any effective Diaspora engagement.Therefore, over the last few years, we have led the Diaspora voice in the UK in advocating for the formulation of a policy that is capable of facilitating the contributions of diaspora to national development. These efforts culminated in a Roundtable that we held in February last year at the Olympic Youth Development Centre (OYDC) in Lusaka, withsupport from the International Organization for Migration (IOM) and Diaspora Support Initiative (DSI) Zambia.The roundtable, themed, “Zambia at 50 Years: Engaging the Diaspora in Inclusive Development”, explored how Zambia could best realise the development potential of its diverse diaspora and whether there was parity between the status of Zambia’s Diaspora debate and current global perspectives.Representatives of the Diaspora, academics, policymakers and practitioners from both the civil society and private sectors attended the event, including the UK Government’s Department for International Development (DFID) Zambia office.We launched the Roundtable report called, DfAD2014, at the Overseas Development Institute (ODI) in London in April of the same year, with support from IOM and Comic Relief. However, DfAD’s policy activities also extend beyond Zambia. In the last few years, we have been actively involved in national campaigns in the UK and at global level through our participation in the Global Forum on Migration and Development (GFMD) Civil Society Days (CSD) processes and in the United Nations High-level Dialogue on International Migration and Development in New York in July 2013. We will also be applying to be in consultative status with the United Nations Economic and Social Council (ECOSOC) in 2016. This year’s significance for development, given the Post2015 processes that are in progress, makes it an opportune time to engage the Zambian Diaspora community. They have the potential to exponentially enhance Zambia’s ability to attain the Sustainable Development Goals (SDGs) over the next 15 years. 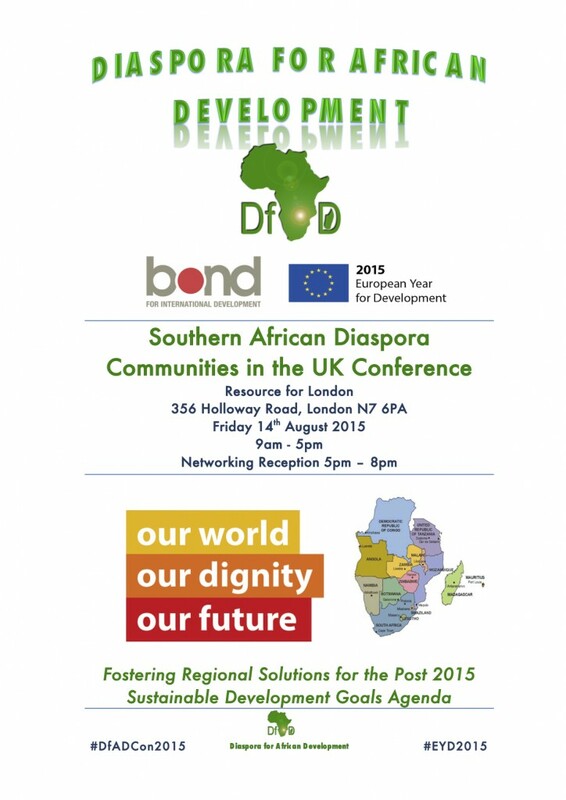 Therefore, in order to disseminate the significant impact that these development processes will have on Zambia and the Southern African region, DfAD is holding a Conference on Friday 14th August 2015 at Resource for London themed, ‘Southern African Diaspora Communities in the UK: Fostering Regional Solutions for the Post 2015 Sustainable Development Goals Agenda’. This conference will facilitate engagement in the bigger Post2015 dialogue and establish a space for sharing best practice that will enable the formulation of diaspora led Southern African regional focused solutions. The conference will also see the launch of a DfAD led ‘Southern African Diaspora Communities International Development Forum (SADCIDF)’ platform that will enable continued dialogue beyond the conference. Key note speakers, moderators and panelists whom we have invited include, His Excellence, the Zambia High Commissioner to the UK, Mr William Lumbi; the UK Chief of Mission for the International Organization for Migration (IOM), Dipti Pardeshi; Portfolio Manager at Comic Relief, Siddo Deva; and an international guest speaker, Mr William Chilufya, National Coordinator at Zambia Civil Society Organizations Scaling up Nutrition Alliance (CSO SUN) who will be traveling from Zambia. This conference has been made possible by funding from the European Union, under the umbrella of the European Year of Development 2015 via Bond. Bond is the UK membership body for organisations working in international development. Going forward, for us as DfAD the recognition that the Zambian Government has placed on the importance of involving the diaspora in formulating the Zambian Diaspora Policy is a positive step in the right direction. Our work so far has affirmed our belief that African Diaspora’s contribution as agents of socioeconomic change should not be measured merely in financial terms, but as inputs of skilled labour and by its ability to build bridges between countries of origin and destination, which help stimulate not only economic activity, but also transfers of knowledge and cultural and social norms. Therefore, our Zambian Diaspora Policy submission today is underpinned by this belief that our effective contribution in the shaping of policy and delivery processes, as they relate to Zambia, is vital if DfAD’s development efforts are to be successful. 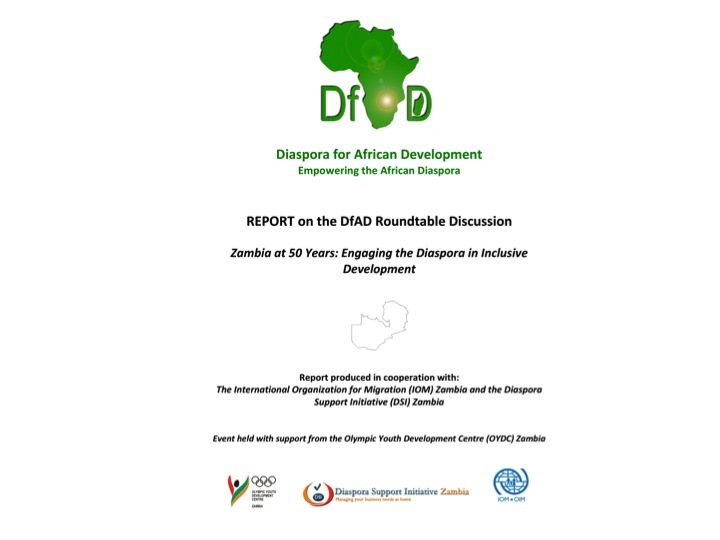 After years of closely following the progress that the Government of Zambia has made towards the development of the Zambian Diaspora policy, it is with great honour and appreciation that I submit, on behalf of Team DfAD, the DfAD2014 report, “Zambia at 50 Years: Engaging the Diaspora in Inclusive Development”, as our contribution to the formulation of the Zambian Diaspora Policy. In closing, DfAD would like to reiterate to the Zambian Government the importance of the role of Civil Society Organisations (CSOs) in making a difference in international development. The agenda today has relegated CSOs to ‘Any Other Business’. However, this can not be the case going forward. As my presentation shows, CSOs play a significant role in influencing foreign government policies and development mechanisms at global level, which have ripple effects on our countries of origin. Key actors such as the United Nations have affirmed the need for purposeful diaspora engagement in international development and especially the promotion of positive engagement with the diaspora by country governments. Acting alone, however, as the case has been in the past, limits our impact in scope, scale and sustainability. Hence, organisations such as DfAD need to engage with the Zambian Government and in policy development processes more effectively. Facilitate the setup of sound and informed regulatory frameworks for diaspora to invest in development and job creation in Zambia. Ensure the portability of skills and benefits by implementing mechanisms that recognise Zambian Diasporas’ professional and vocational qualifications in countries of destination. Facilitate political participation at both local and national levels in order for Zambian diaspora to contribute to public policy changes. No Comments to "DfAD Zambian Diaspora Policy Submission"